This weekend we went on a real adventure. 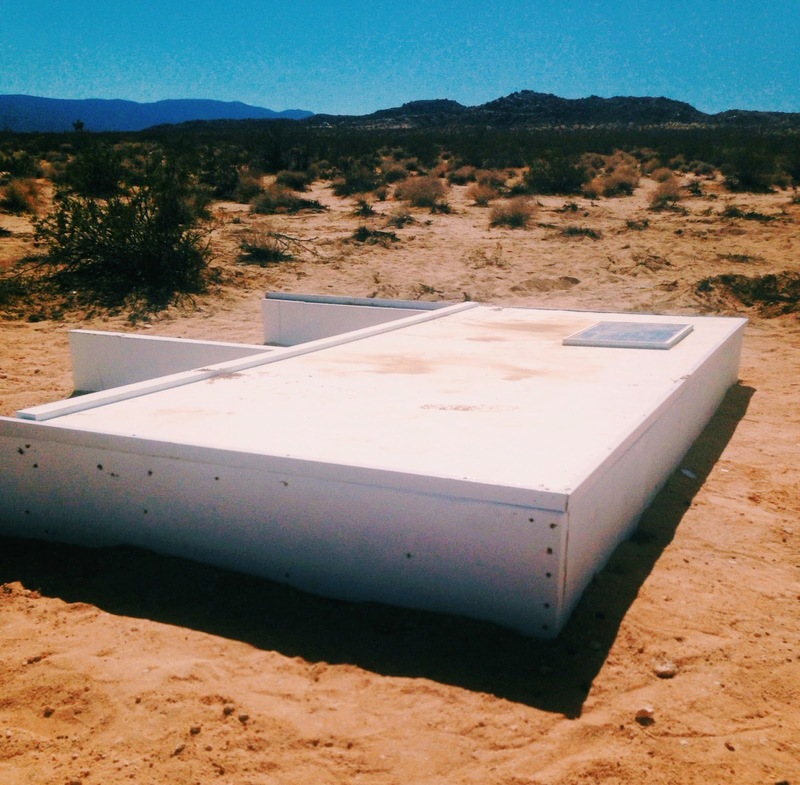 At 11AM sharp Sunday morning, we headed over to the MAK Center for Art & Architecture to pick up the keys to Social Pool, a solitary art piece by Alfredo Barsuglia in the middle of the desert. With the keys we received GPS coordinates and license to romp in the California cacti. 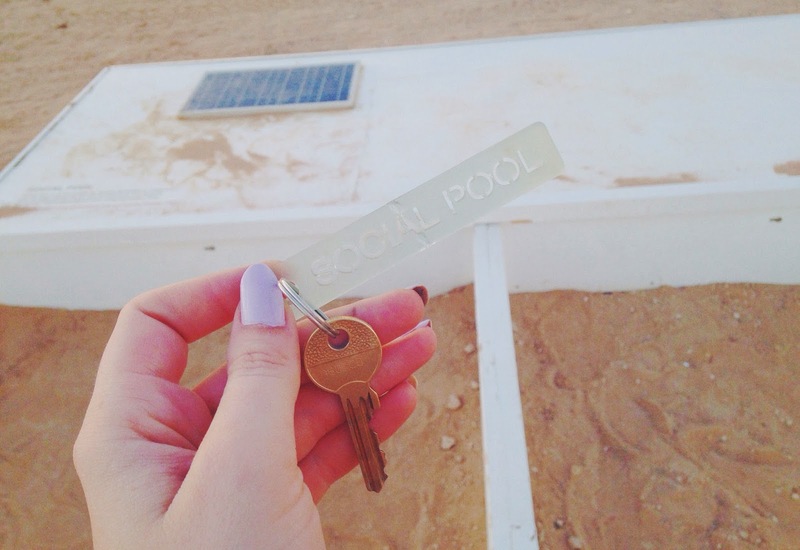 Social Pool is meant to provide visitors with "time to reflect on social values, dreams and reality" as stated by the artist. All we knew was that the drive would be considerable, and likely take us on some unpaved dirt roads before we'd have to walk some distance to the pool itself. Maybe we got a little lost in said reflecting. But soon we had a #socialsuccess thanks to our intrepid orange-shorted scout. It wasn't as out in the wilderness as we thought - just a half mile down the dirt road we parked on was a trio of Walter White-worthy trailers, and only one looked habitable. We hoped it wasn't, considering we would be a little vulnerable as we "experienced the art" if you will. Four feet of dust and abandoned pool toys. For a hot, sun-filled day like ours, there were a few necessities stowed away in my bag. Neutrogena Fresh Cooling Sunblock is perfect for spraying yourself down - it really does cool you! For the face, I like a non-greasy formula, so Neutrogena's Visibly Even Daily Moisturizer fortified with SPF is perfect. And I know, I know, why would you wear mascara to a pool. But Revlon's new Bold Lacquer comes in a great waterproof version, and I can't resist the blackest of black color. Finally, a tinted lip balm by e.l.f. to keep my lips pretty and protected with SPF 15. We were the most prepared social poolers. No pool day is complete without some good background tunes - Summer Vacation by Failed Flowers might be an obvious choice, but what can I say? I like a dreamy punk crooner babe to go with my splashing around. Did you know the desert is full of babes? Our provisions list also extended to the beverage side. 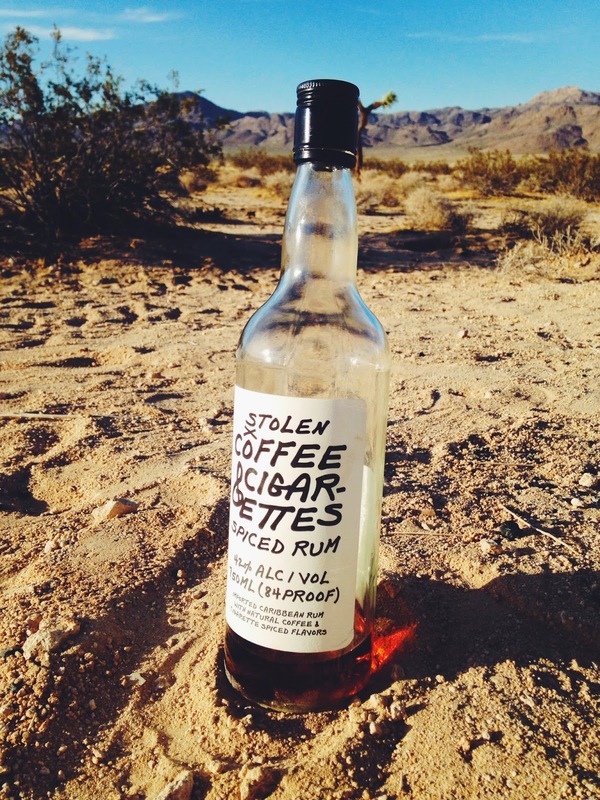 This rum by Stolen is incredible - it really does taste like coffee and cigarettes, and with a fresh coke it's divine. Especially at a remote pool off a dirt road, with only an inflatable lizard to judge your indulgence. After a while in that hot hot sun, I needed some well-deserved shade - with some style, duh. Enter Melin's fab snapback "The Garden." Yeah, my snapback has a name. Melin makes some badass luxury hats, and I'm honored to rock the brand! Plus, it was a great complement to my fading pink hair. But the sun eventually started to set, and we needed to be on our way. We had heard that locals (and critters) liked to stop by the pool at night to "check on it" - I don't know what that means in Breaking Bad-speak, but I didn't want to find out. Ultimately the day was a very freeing exercise in the art of retreat and letting go. We traveled a long way from our city just to find a hole in the desert filled with water, which is an obviously surreal and unlikely hunt to begin with. We weren't the first, and we won't be the last. But we are some of the only audience this piece will have way out there - except for the locals and the coyotes, of course. 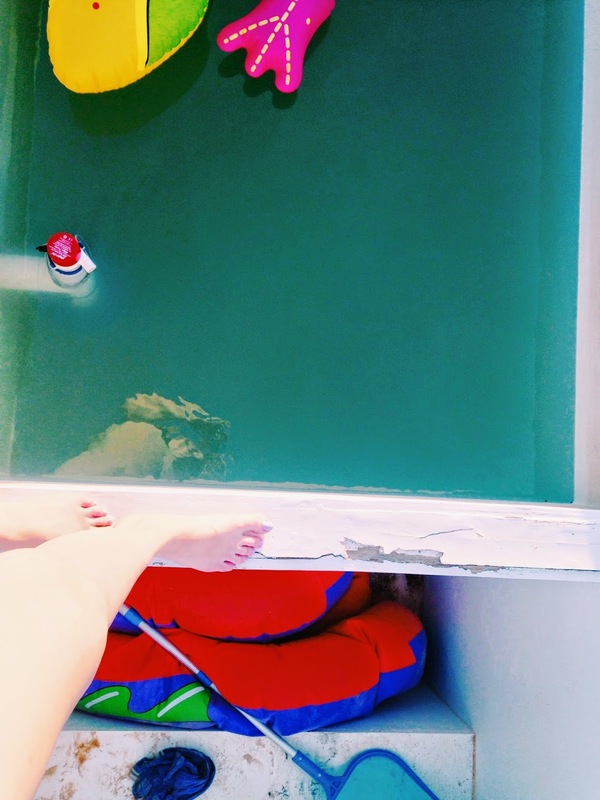 While you're at the pool, in a way you are the owner and proprietor. The key is yours, the locks are yours to open, the pool is yours to enjoy. When you leave, it feels like the pool is now a Place You Know and can go back to anytime - but you can't. So while you're at Social Pool, really feel it, because it's the only shot you get. Until next summer, that is. i love all ya'lls post. dont know if im ya'lls biggest fan but im def prob the only 6 foot 5 won with a dark caramel coco complexion. keep it up!